I attempt to answer questions submitted via email and on-line. If you have other questions, please feel free to post and ask. There are no secrets here. It’s one of the many designs in T2CM. It’s quasi-original, based on a 15th century strip pattern from my all time fave V&A sampler, the famous (and infamous) T.14.1931. I presented the strip in TNCM, but here have morphed it into an all-over. There are only two designs in T2CM that revisit some aspect of a pattern from the first book. This happens to be one of them. What stitch are you using? Mostly double running, with short hops in “Heresy Stitch”. But I’m not being slavish about the double-sided/double running protocol. I am using knots, and I am strongly considering a muslin lining for my forehead cloth. I think it will help it wear better, by reducing stress on the ground fabric. Therefore, with the back well hidden, I am under no pressure to do a perfect double-sided parlor trick. That being said, I do tend to stick to double sided logic for best thread economy and minimal show-through. What thread and ground are you using? The ground isn’t fancy – it’s a prepackaged linen or linen blend even weave, with a relatively coarse thread count of 32 threads per inch. It is stash-aged, and parted company from the packaging long ago, so I am not sure of the brand name it was marketed under, or the retail source. I’m stitching over two threads, so that’s about 16 stitches per inch. I tried stitching over three, but thought the look was too leggy. I am using a special treat thread – a small batch hand-dyed silk from an SCA merchant. I got it at Birka, and I hear it will be intermittently available at the Golden Schelle Etsy shop*. The thread is dyed with iron, tannin, and logwood, and is a warm black in color. In thickness it is roughly equivalent to two plies of standard Au Ver A Soie D’Alger silk, although it is not a thread that can be separated into plies. Do you wax your thread? Yes. For double running stitch work, even in silk, I wax my thread lightly with beeswax; paying special attention to the last inch for threading through the needle. While I would not as a rule wax the entire length of the silk for work that depends on sheen (like satin stitch), at the very short stitch lengths used in double running, loss of sheen is minimal. Waxing keeps the thread from fuzzing against itself as it is pulled through the same hole more than once, and (if you are working with multiple strands) minimizes the differential feed problem, without resorting to using a laying tool – which I find tedious for such short stitch lengths. Others adore laying tools, so use of them is a matter of personal preference. 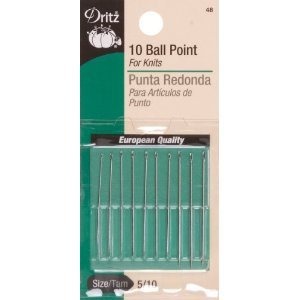 I favor a rather unorthodox choice for single strand double running – ball point needles intended for hand sewing on tricots and fine knits. They have a nice, rounded point, that slides neatly between the threads of my ground fabric, and a small eye. Blunt pointed needles intended for embroidery often have large eyes, which make thread management for a single strand unwieldy, allowing it to slip out of the eye too readily. How do you know when to “go back again” in double running? A lot of people think that working double running means you head in one direction, then turn back and retrace your steps. They carefully calculate the length of their stitching thread, and when they get to the half-consumed point, turn around and go back. This works, but tends to cluster thread ends. If you cluster your ends you end up with (for double-sided work) a large number of ends to hide in a very small space, or (for single sided, with knots) an untidy zone, with many knots and ends in the same place, which can show through to the front. Instead I just keep going. I use up my length of thread, following my stitching logic, headed in one direction. Then I begin a second strand,staggering my starting point from my original start, first filling in the previously stitched path, and then extending the design further. Since I tend to do offshoots and digressions as I come to them and these do eat more thread as I trace them out from and then back to my main stitching line, I rarely have more than two ends at any one point in my work, and those two-end spots are widely distributed, rather than clustering in one small area. How do you determine the baseline and stitching logic in an all-over? There’s a little bit of catch-as-catch-can, but the basic concept is dividing the work into zones. In this piece the zone is flexible, and can be centered on either square area bordered by the spider flowers, connected by the twisted framing mechanism; or on the smaller area defined by the “root zone” of those spider flowers, again connected by the twisted framing. I go around either one of those, hopping between them as needed. In either case, the small center elements – the tiny quad flower, or the quad flower with the elongated tendrils, is worked separately, with no jumps back to the main motif. And speaking of that tendril-flower – I am not entirely happy with it. I may pick it out and draft something else to go there. For the record, the nice, large square it inhabits would make a nifty place for initials, heraldic badges, whimsical creatures, original motifs, or other personal signifiers. Why are you using a round frame? Because I have two flat frames and one round (tambour) sit-on frame, in addition to several round in-hand hoops. I have works in progress on both flat frames, and don’t want to dismount them to do this quickie. My tambour frame has a padded bottom hoop, and when time comes to move the fabric and squash bits of just-done embroidery, I will pad the work with some muslin to protect it on the top as well as the bottom side. 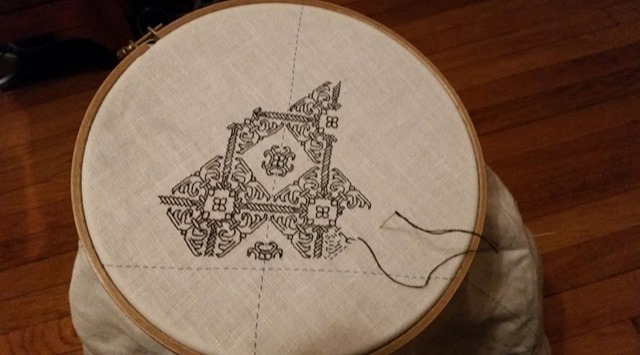 Again, working short stitches with no raised areas – even in silk – makes this a less risky proposition than it would be for other stitching styles. Can I see the back? In the next progress post I’ll include a shot of the back. * In the interest of full disclosure (and the no-secrets here thing), the un-named proprietor of Golden Schelle is my Stealth Apprentice. Shhh. It’s a secret. For a Forehead Cloth you are working on the diagonal of a square cloth. Will you stitch over the entire square, or just the triangle for the Forehead Cloth? And if just the triangle, will you cut off the other triangle, or fold it under? That is looking beautiful! Thanks also for the link to the amazing V&A sampler – it could be mined for ideas for many lifetimes. I must take your tip and invest in some wax; I imagine it would make frog-stitching easier, too. At my level of inproficiency I frequently miscount and need to frog. Waxing doesn’t make the thread slide out easier when picking back, but the combo of waxing and a blunt point make piercing previous passes less of a difficulty, and picking out becomes neater – with less surface fuzz left behind.